If your work involves sitting at the computer for many hours, it is important to reduce the tension build up in the first place by sitting in a healthy upright posture, with your lower back supported and your arms supported by your side, in line with your keyboard. See your doctor for a diagnosis or recommendation for further treatment, including surgery. Try stretching exercise classes that build the core and help correct the areas of tension build up, such as pilates, yoga or consider Tai Chi or the Alexander Technique for good posture . Always declare your injury to the teacher of the class. Heat and/or cold therapy helps relieve most types of low back pain by reducing inflammation. Often patients use ice pads, but some prefer heat. Both may be used alternately and there are many options available at pharmacies. A wide variety of over-the-counter and prescription medications is available to help reduce lower back pain. Seek advice as to which is best for you. Use a proper ergonomic/orthopaedic chair or adjustable back support cushion to correct your posture and allow your back to heal by reducing tension and pain build up from bad posture keep muscles strong. Every individual is a different shape and size, even two people of the same height and weight will require different settings in a chair. Corrigo chairs recognise and embrace this individuality and our chairs therefore provide far higher levels of adjustability found in most chairs in the market place. The key areas of support needed to prevent and reduce frozen shoulder are the lumbar curve, the upper back and arms. Our arms are surprising heavy if unsupported when working at the computer, and tension in the neck and shoulders will build up over time, potentially leading to frozen shoulder if not addressed. This is further exacerbated if the back is also not supported in the correct place. 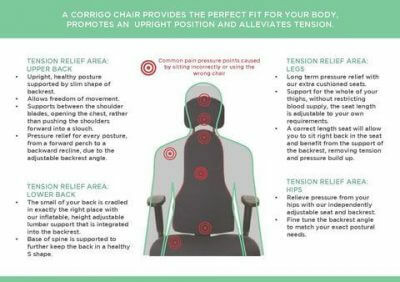 Corrigo chairs have been specifically designed by an ergonomist and physiotherapist to prevent and reduce back pain by ensuring a healthy posture. If you are seeking treatment, it is essential to maximise your recovery and rehabilitation plan by correcting your posture, allowing your back to heal. No more slouching. or click HERE for more information on the Corrigo Libero Chair.